Start here, with the answers we’ve shared to some of the questions that are frequently asked. If you don’t find what you’re looking for, try our other customer service resources, or reach out to your dealer or our main office directly. What are Pro-Tech Sno Pushers? 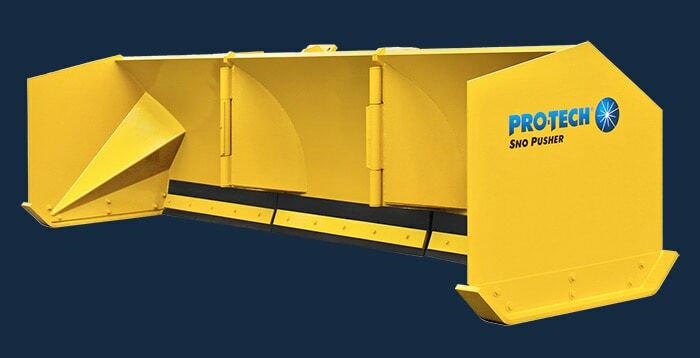 Sno Pushers are containment plows, designed and manufactured by Pro-Tech for use attached to Skid Steers, Backhoes, Loaders and other heavy equipment. Unlike conventional plows, Sno Pushers can capture large amounts of snow and move it forward to designated snow piles. Standard plows can only windrow snow off to the side, which is inefficient in large lots. Check our selector charts for detailed information on models for use by dealer and equipment type. Where are Sno Pushers used? 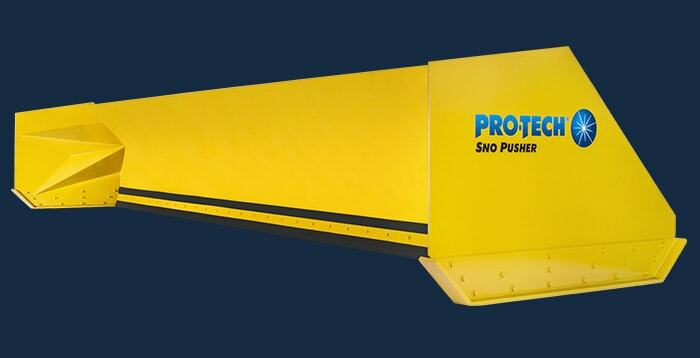 Why buy a Pro-Tech Sno Pusher? 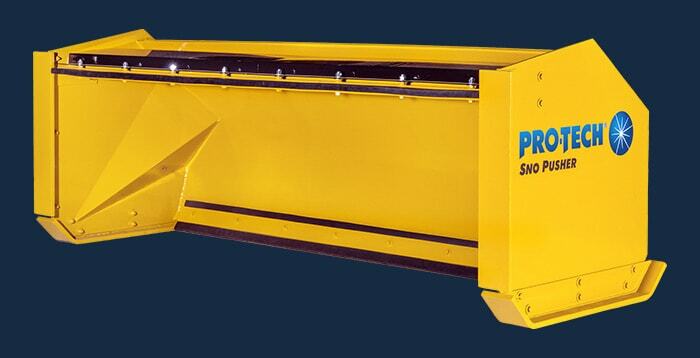 Efficiency gains – Sno Pusher owners report increases in productivity up to 500% over conventional blades or buckets. Move more snow, in less time with fewer man hours invested. 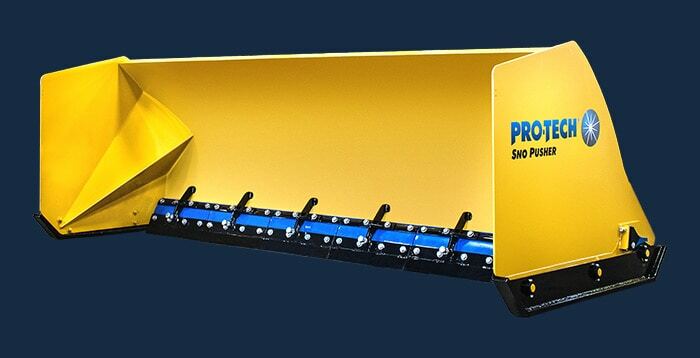 Higher Profitability – A single Pro-Tech Sno Pusher will do the work of 3 to 4 trucks in less time. How? Customers also report consistent increased profit potential on jobs bid; which enhances job award potential and ultimately allows them to maintain higher profit margins than were possible with conventional equipment. How fast can purchase costs be recovered? Sno Pushers can and SHOULD be used for all snowfall events — light or heavy. Purchase costs are generally recovered in less than a single winter snow season. Pro-Tech also offers several custom connection options. Does the bucket have to be removed? No! Leaving the bucket attached can be a benefit! When a bucket stays on with a Sno Pusher used with a loader or backhoe it makes the operation safer and less expensive to repair. If the operator were to hit an obstacle, impact would most likely break the chain connecting your bucket to the Sno Pusher. If the Sno Pusher were to be directly connected to a loader’s arms, the impact would be more likely to damage the loader’s arms, which could be a more expensive fix. 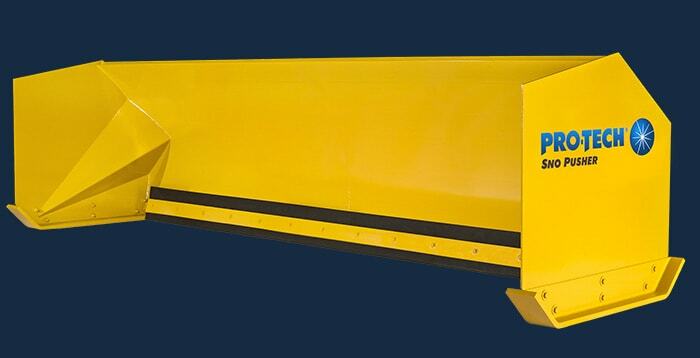 The Steel Edge Sno Pusher components should be worn at the same rate. The shoes and steel edge should be replaced at the same time to maximize the scraping performance of the unit. Will a Sno Pusher put more wear and tear on my machine? Trip-action Rubber Cutting Edge: Matches the contour of the surface being plowed. Wear shoe positioning: Sno Pusher wear shoes are raised to a 45 degree angle, front and rear, with a 6″ height to ride over obstructions and curbs. 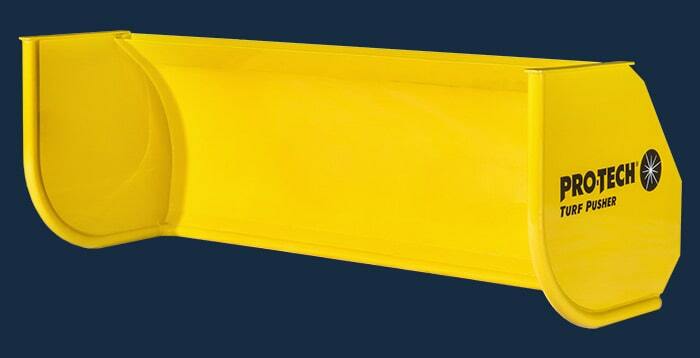 Reduces impact and damage to contract sites. Quick Change Attachment System: An engineered breakout force in the chain clevis allows the unit to break free from the machine’s bucket should an accidental impact with an immobile object occur. 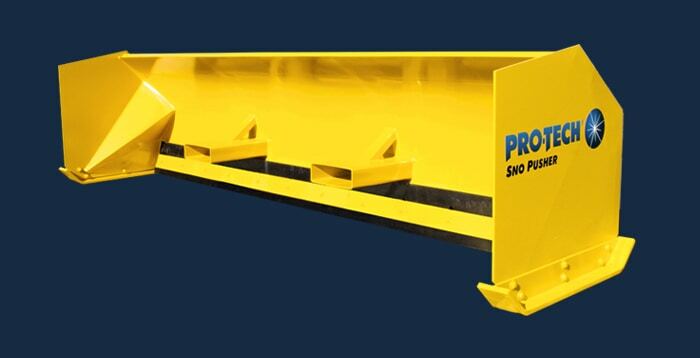 The combination of these three results in significantly reduced damage to equipment, contract sites and lower incidence of injury to machine operators. When are Sno Pushers used? Sno Pushers are used in any snow conditions from 1″ to more than 12″ –with any type of snow, wet or dry. 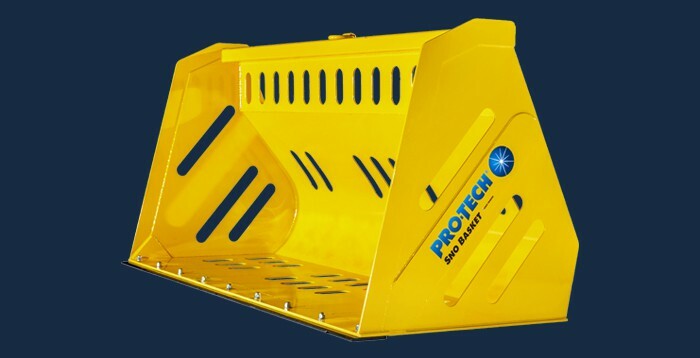 Rubber edge Sno Pushers are more ideal for wet snow and Steel-Edge Sno Pushers work best for dry or hard pack snow conditions. Can I pile snow with Sno Pushers? Yes. You have full range of mobility to pile snow as high as your machine can reach. This gives you the ability to strategically set up stacking points in the area you are working to keep snow piles away from heavy traffic areas. What about icy snow and hard pack? 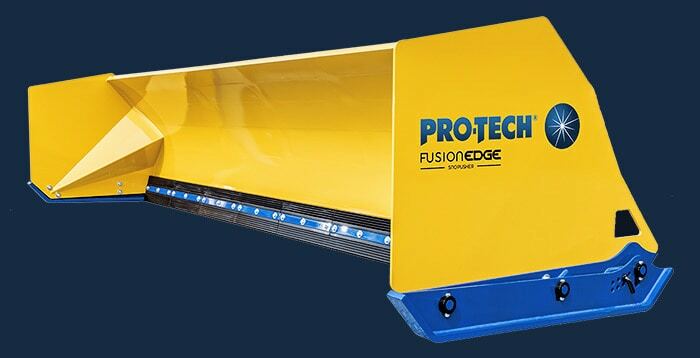 You may wish to consider Pro-Tech’s Steel Edge Sno Pusher or the new Fusion Edge Sno Pusher. 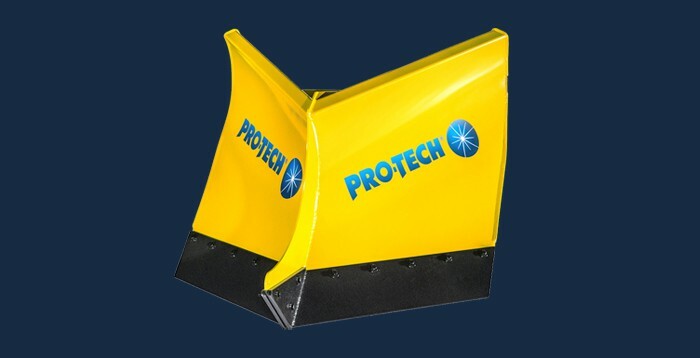 Pro-Tech’s Steel Edge Sno Pusher allows the operator to EASILY break up hard pack and icy snow, while the unique polyurethane tripping system reduces the danger from raised obstructions such as curbs and manhole covers. The Fusion Edge Sno Pusher features a steel infused rubber cutting edge that provides incredible performance and ease of use. If you do not have a Steel Edge Sno Pusher then use the bucket or conventional steel-edged-plow to break up the ice and hard-pack. Do Sno Pushers have other uses? Yes, they do. 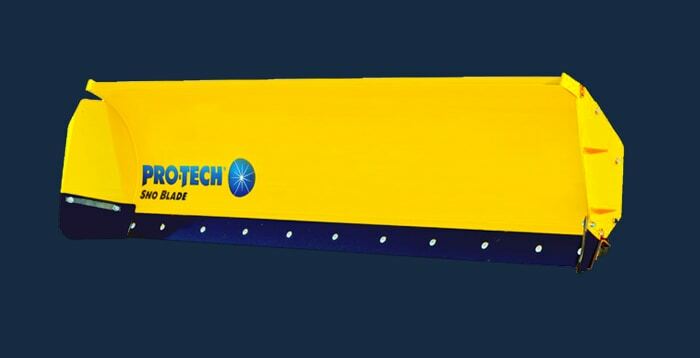 They are being used by Agricultural and Wastewater industry operations with increasing frequency. Sno Pusher units can be used for any light materials moving/handling – ranging from water, mud, sludge, silage, manure, and grain to trash. Some slight modifications may be necessary/appropriate. Can a Sno Pusher connect to an OEM quick coupler? They can and Pro-Tech offers a wide variety of custom coupler options. 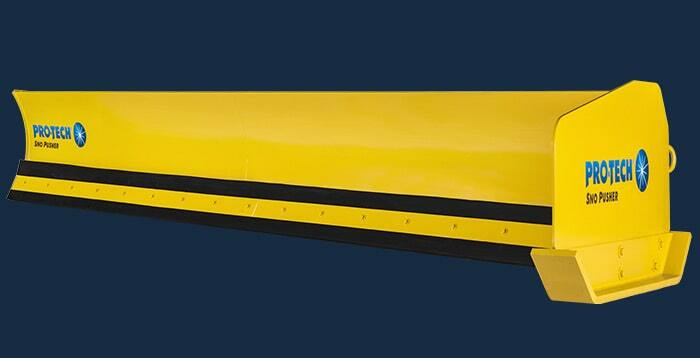 For more information please call us or visit our Custom Sno Pusher Options page. Question not answered above? Submit a question to us for a direct response. Already Own A Pro-Tech Sno Pusher?